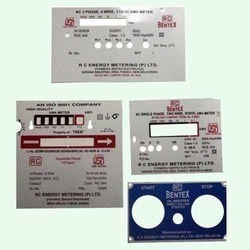 Our range of products include anodized aluminium labels and anodized metal lables. The Anodized Aluminium Labels available with us are available along with glue for sticking them. Available in different sizes, shapes and colors, these anodized levels find application for promotional purposes and other client specific uses. We offer customization of our products as per the specifications of our clients. Our range of anodised labels are available at market leading prices. we are offering Anodized Metal Lables in variety of shapes and sizes. 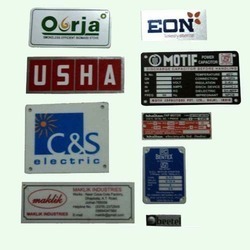 Our company produces aluminium name plates and serial number plate according to the customers requirements. We apply screen printing or aluminium printing with chemical etching effects. These aluminium name plates or front fascias can be bent and fitted with threaded studs.